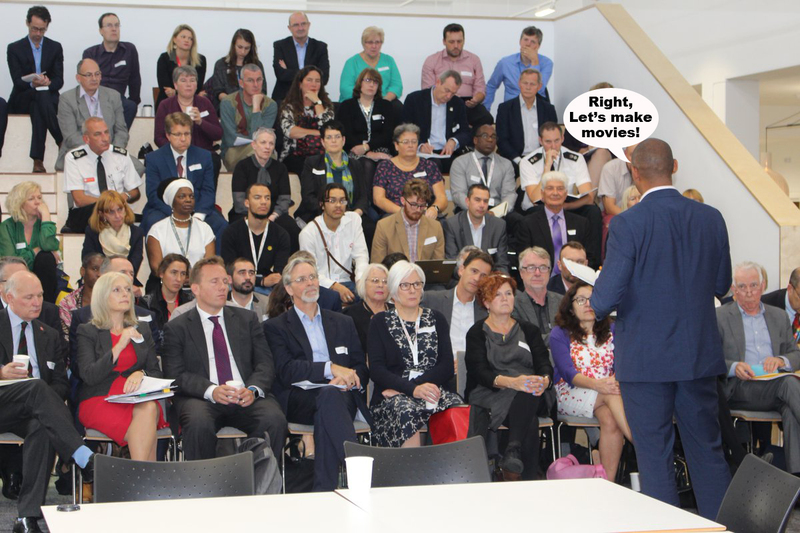 A dull photo-op last month of old men in suits vacantly sat around in an open plan office while the Reverend Rees waffled aimlessly to journalists about homelessness signalled the launch of the Reverend’s big idea – THE CITY OFFICE. The ‘BIG IDEA’ is to get bosses from business, public services and the voluntary sector together to solve the city’s problems. So 75 bosses gathered at the Counts Louse on 29 September to have their photo taken in front of the local press while pretending to listen attentively to the The Reverend as he tried to convince us all that this was all terribly exciting and the whole world was watching and waiting on his initiative with baited breath. The City Office, itself, we were told, would be focusing on homelessness and rough sleeping to start with. However, the noticeable absence of any CASH TO SPLASH or even any new policy to launch meant we had to settle for a PR RELAUNCH of the ‘Bristol Street Aware’ campaign. An initiative started by corporate retailers in Broadmead last year to clear rough sleepers off their doorsteps by ‘signposting’ them into unpopular homeless hostels run by the charity St Mungos. This lack of money and ideas for the homeless starkly contrasted with the Vicar’s decision five days later at his cabinet meeting to hand over £692k to a Southville-based consultancy firm to continue running the BOTTLE YARD FILM STUDIOS in Hengrove. This is the film studio that’s already receiving about £1m in public money every year according to the council’s published expenditure accounts. The studios appear especially popular with BBC producers looking for cheap, publicly subsidised deals. The Reverend and his Cabinet decided to HAND OVER MORE PUBLIC MONEY – grabbed from a restructured loan deal relating to the shadowy Hengrove Park housing development – to the city’s creative industries despite this council owned film studio and its firm of consultants providing NO MEANINGFUL ACCOUNTS or BUSINESS PLAN to support their large financial demands on the public purse. The Rev and his cabinet have therefore handed over money earmarked for one of the city’s most deprived areas on the basis of UNSUBSTANTIATED CLAIMS by council bosses that this studio will make a £100k surplus next year and – an even more UNLIKELY CLAIM – that it is generating £16m for the city’s economy every year. Naturally The Reverend’s house-trained Cabinet agreed to this nonsense with no questions asked. HRH Helen of Holland, the cabinet member responsible, gushed that the EVIDENCE-FREE PIFFLE supplied by senior council bosses was “A GOOD NEWS REPORT“. While Deputy Mayor Estella “Tinkerbell” Tinknell only seemed bothered about “developing our media profile as a VIBRANT FILM AND MEDIA CITY“. Presumably regardless of the cost or the fact most of us couldn’t give a toss about “media cities,” whatever they are? Moreover, the true cost of the council’s latest publicly funded creative industries VANITY PROJECT was carefully hidden by the Rev’s senior bosses who neglected to explain properly that a further £0.6m is also required to buy the studio’s FREEHOLD. That’s a total of £1.3m being poured in then. The same senior bosses also forgot to explain if there’s any RISK attached to their expenditure, projected to gain a paltry income of £100k a year from the studios. Is this the world’s first risk-free business? The average whelk stall wouldn’t be run like this, let alone a MAJOR PUBLICLY FUNDED PROJECT. But who cares if we’re keeping creative industries bigwigs in the style to which they’ve become accustomed and we’re “developing our media profile as a vibrant film and media city”? This entry was posted in Culture Vulture, News and tagged Bristol Street Aware, City Office, Estella Tincknell, Freehold, Helen Holland, Hengrove, Marvin Rees, St. Mungo's, Subsidy, The Bottle Yard on December 1, 2016 by thebristolblogger.